The coach comes apart relatively easily, although the risk of breaking a plastic locating clip is always high - its really designed as an 'assemble once' fixing so be prepared to glue something back on. 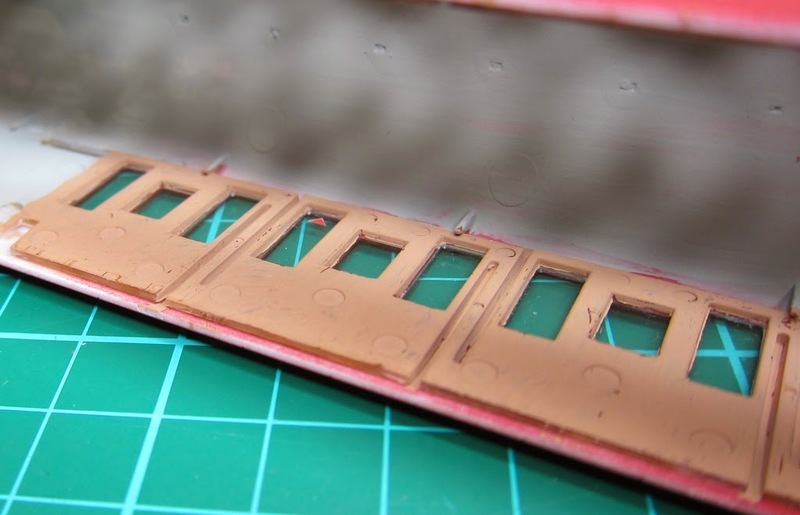 The steps on the bogies are fairly fragile and having proved this by knocking two of them off, I can highly recommend using a flat bladed screwdriver to gently prise the bogies out of the coach floor. The couplings are released by undoing the screw at the pivot point, then turning the coupling at 90 degrees to the body to release the small spring. 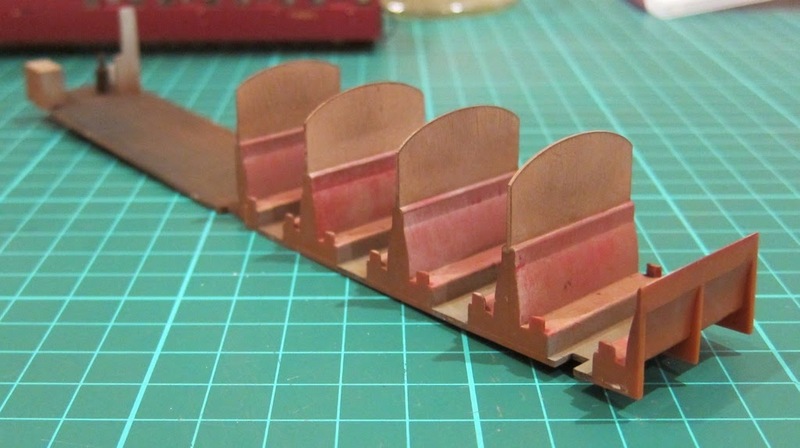 There are four plastic clips, one in each corner that are moulded as part of the glazing. Gently inserting the screwdriver blade between the side of the floor and rotating against the clip frees them although one of mine broke (it glued back OK using MEK, as did the aforementioned steps). I needed a pair of pliers to grab one of the webs on the underside of the interior insert to pull it out, but that is pretty much it. Looking inside the body shows a blend of colours as a result of the primer and top coat. 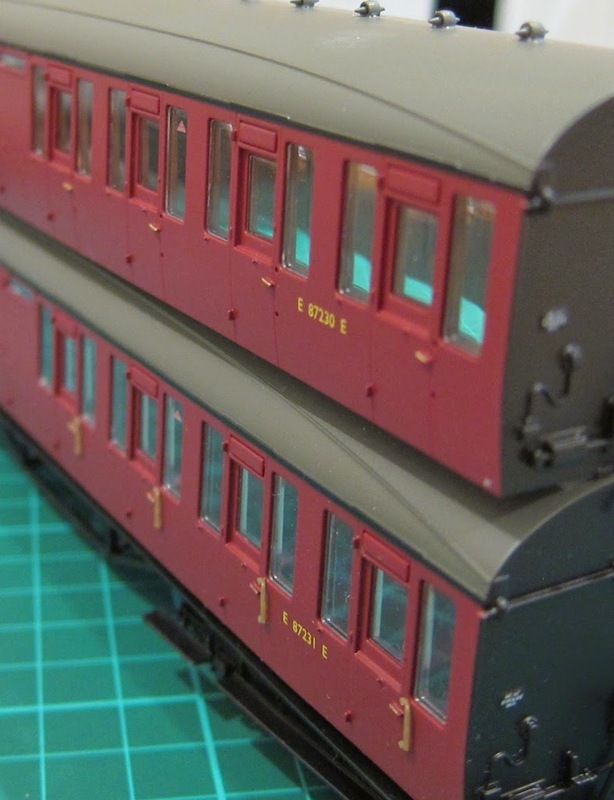 The first job was to paint the inside of the guards compartment and roof in a light grey with the passenger area in a mid brown. Although its a bit difficult, its worth painting around the recess for each window, it has a huge impact on reducing the prismatic effect on the glazing. 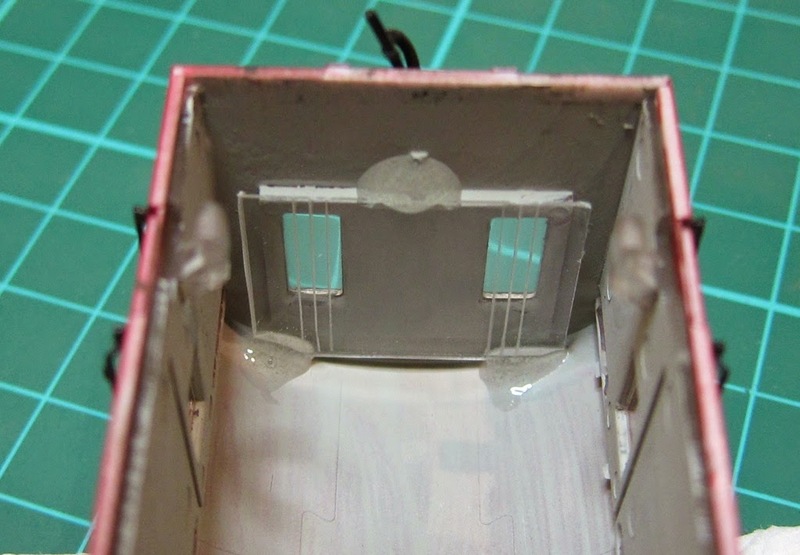 Further improvements can be made to touch in the odd area where the white primer shows around the window edge - I did this as part of the weathering. From what I've been able to understand so far, the brake second was effectively a renamed brake third meaning that the seat fabric was unlikely to have changed. I had a lot of help from a friend called Graham who also sent me a link showing a good example of the seat fabric that could have been present. Given that its going to be viewed through the windows (and probably not close up very often), it was a quick job to throw some paint on and dust it down with some weathering powders. The door handles have also been removed at this stage - the coaches had them when they arrived on the CVLR, but they disappeared fairly soon after. I'm experimenting with filling the holes with short lengths of plasticard rod, then a filler composed of paint and talc. Its not hugely successful as I've used the roof dirt colour to do so - I think I'm going to have to try and track down a good match to the main body colour instead (I'm only half way through filling in the above photo). The bars in the end windows of the coach were made by scribing a set of parallel lines into a second piece of glazing that was then glued behind the original coach windows. The coach body was then reassembled, the sides masked off and the roof and ends blown over with Lifecolour Roof Dirt. The same colour was brushed into all the recesses around the doors, windows and panel lines, the excess being removed with a piece of tissue. 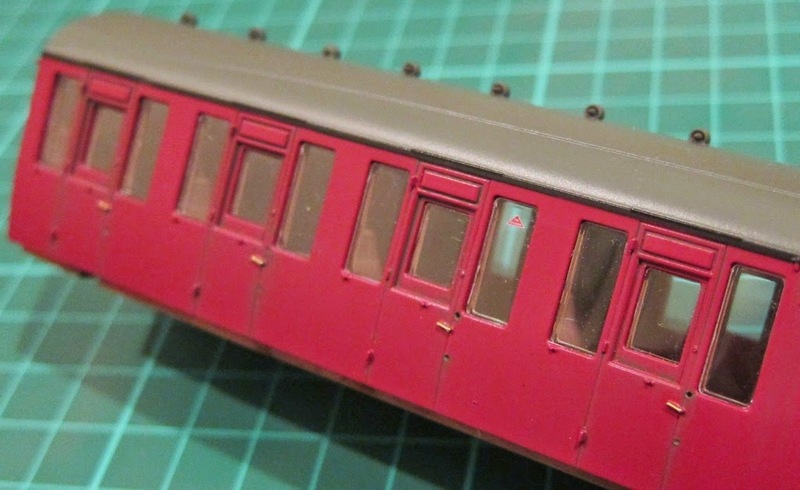 Weathered black was painted over all of the handles, then an underframe dirt colour was airbrushed over the underframe and bottom of the ends. 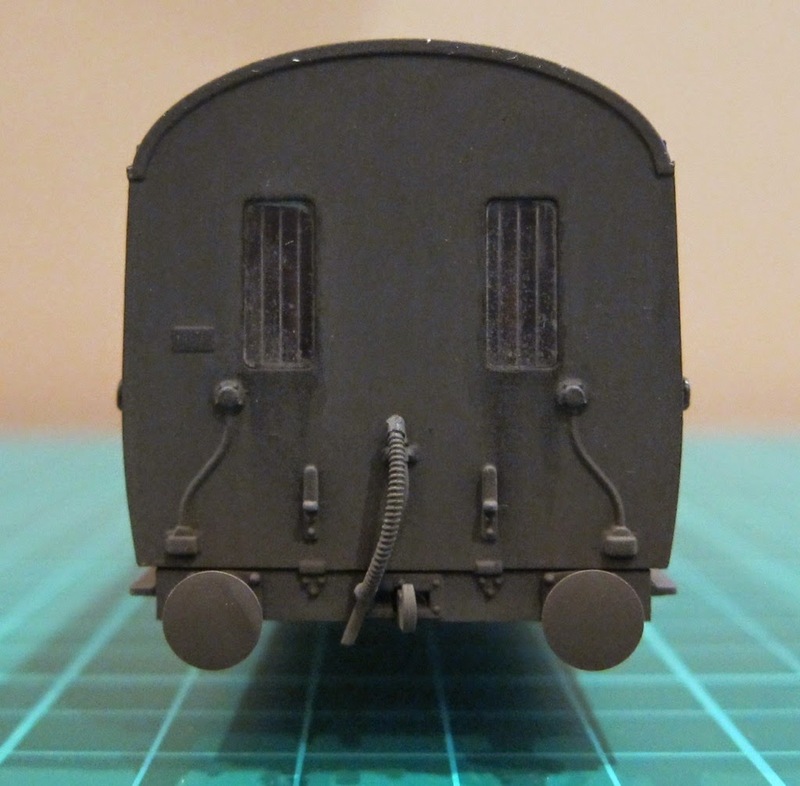 A bit of black was drybrushed under each window on the coach end to represent the water that had run down after a previous window clean. That brings the body up to date, I've converted one bogie to EM so need to do the other one and fix the couplings, paint both of them in the matching underframe colour and put it all back together. A spot more weathering to tie it together and bring out some of the detail will probably take me the rest of the week - sounds a pleasurable way to spend a few evenings to me.